The 100 Euro Bamberg gold coin was issued in 2004 by the German Bundesbank as a commemorative coin. 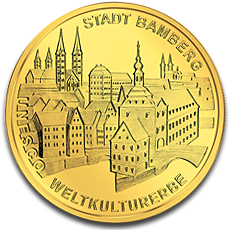 It was minted in order to celebrate Bamberg, a German town whose historic city center was included in 1993 in the UNESCO world heritage site list. It means that this city center is of major importance from a cultural and a historic point of view, fact that makes this coin to be a favorite one for collectors. Gold is a precious metal chosen to commemorate major events and to lively preserve images that through gold coins are surely to be transmitted from generation to generation. Therefore, past cultures and history are transmitted through gold coins and one example of such coin is a 100 Euro Bamberg gold coin minted in 2004. This gold German coin was manufactured from exactly a half ounce of pure gold; therefore its weight in gold is the equivalent of 15.55 grams. As the majority of the German gold coins minted starting with 2001, when the last D mark coin was minted from gold to commemorate the replacement of German marks with the Euro currency, it has a purity of 99.90% gold. A 100 Euro Bamberg gold coin has a diameter of 28 mm. It is a preferred gold coin to collectors and historians because on the obverse of a 100 Euro Bamberg gold coin minted in 2004 is illustrated the medieval city of Bamberg, a beautiful miniature image in gold that has even captured the two famous bridges. The inscriptions present on the gold German coin minted in 2004 are: STADT BAMBERG, UNESCO, and WELTKULTURERBE. The reverse of the 100 Euro Bamberg gold coin illustrates the famous German eagle, a traditional reverse which remained a heritage from the out of circulation German marks. On the reverse are also depicted the 12 stars of Europe. The inscriptions present are the minting authority BUNDESREPUBLIK DEUTSCHLAND, the denomination of 100 EURO, and the minting year 2004. The reverse also presents the letter F, located under the left wing of the German eagle. This letter tells us that this 100 Euro Bamberg gold coin, illustrated on our website, was minted in Stuttgart. By investing into the 100 Euro Bamberg gold coin, investors will benefit from 1/2 troy ounces of gold of high purity, which is not at all an investment to be neglected. This German commemorative gold coin minted in 2004 is priced accordingly to the gold spot price to which it is added a small premium. If demand for this gold coin increases, its premium will increase, and so the investor will have a profitable asset in his possession. In 2004, the only year in which the 100 Euro Bamberg gold coin was minted, there were produced a very limited number of 80,000 gold coins for each of the five mints placed in Berlin, Munich, Stuttgart, Karlsruhe, and Hamburg. This scarce mintage, which sums up a total of 400,000 gold coins, makes this gold coin very appealing to collectors. If we have raised your interest for the 100 Euro Bamberg gold coin, you can find it on our website at a very affordable price.